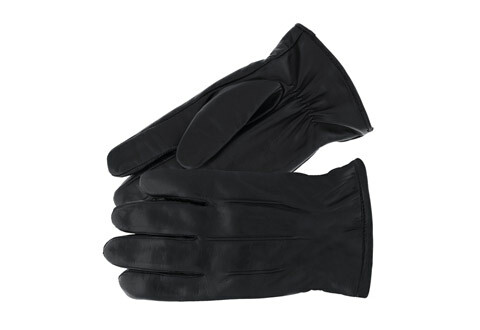 Made with advanced TouchTec Leather and a cashmere/lambswool lining, our Men's Black Leather Touchscreen Gloves mimic the touch of human hands to control your personal devices while keeping your hands warm and dry. Browse the web, zoom in and out, and type out text messages, without removing these handsome gloves. They’re warm enough for extreme weather, but sensitive enough to control any iPhone, iPad, iPod touch, Samsung Galaxy or other Android device. For proper sizing, measure the circumference around the widest part of your palm. Available in Large. 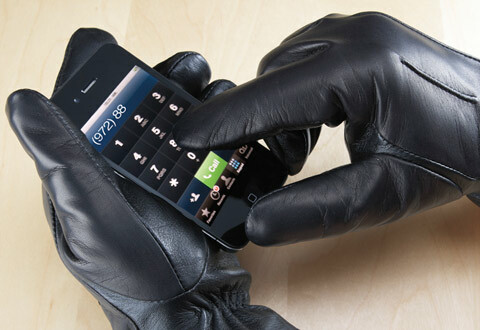 Our Men's Black Leather Touchscreen Gloves let you control your touchscreen devices without taking them off. Stay warm and dry — and connected — all winter long!